The epitome of English eccentricity, narrow, winding streets, barely wide enough to swing a kitten, and stone cottages of every shape imaginable. Once a pilchard fishing port and now a haven for the arts. Every other shop appears to be a gallery, with many international artists setting up amongst these cobbled streets. 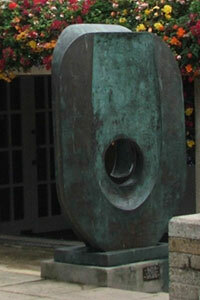 Barbara Hepworth (1903-75), the town’s world renowned sculptress is commemorated here in a sculpture garden. Some of the best holiday beaches are here, along with countless childhood memories. Porthmeor lies before the Tate St. Ives, and Porthminster is a wonderful family beach. But the heart of the town is the harbour where another beach is revealed at low tide. 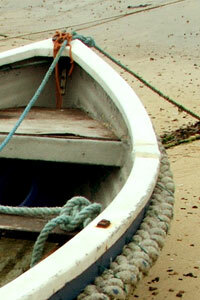 Here, fishing boats still ensure St. Ives maintains the tradition and air of centuries before. There is a great deal of history to be observed, from the town museum to the fisherman ’s chapel, reputedly standing on the site of a 6th century chapel founded by St. Ida. On the harbour stands the impressive lifeboat station, which never fails to capture the attention. As you would imagine for a world famous resort like this, there is much to do, entertainment for all ages. Sports such as golf and fishing are available, along with boating, bowling and riding. There is also a leisure centre and cinema. Cornwall’s cuisine has jumped forward in recent years, and eating out in St. Ives is no exception. Stylish restaurants grace the harbour and atmospheric streets, but do not over shadow the homely cooking of cafes and tea rooms. A night club and plenty of pubs offering live music make certain that the evenings are bustling, and entertainment in St. Ives is never in short supply, but do not take over the friendly air that permeates the town. The town centre never seems to end, always going around another corner and uncovering more independent retailers. 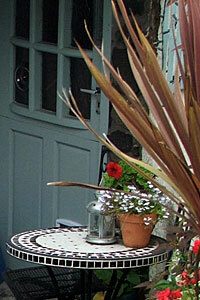 There are a great many shops in St. Ives: gift shops, galleries and crafts; and all in plentiful supply. Unique establishments are by far in the majority which is a welcome change; and when shopping in St. Ives, all your needs are catered for, along with supermarkets at a short distance. 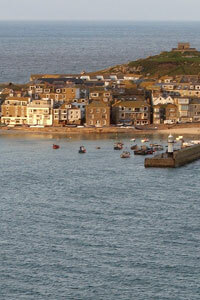 Just out of town, overlooking St. Ives Bay, there is farmland, some of which is used to grow Cornish flowers. These are available to buy online from anywhere in the UK. 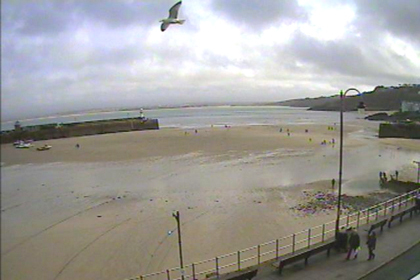 Live streaming shot of St. Ives Harbour. Miles of golden sands, beautiful, and, very importantly, clean. Some of the cleanest waters in Western Europe in fact. Most of the beaches are patrolled by lifeguards as well, during the season. Being a well known surf destination, the town has a good quota of surf shops, many providing hire also. There is also a surf school here. The downside to being such a high quality resort is the crowds, Porthmeor can get very busy. It has good sand, facilities, and generally has great surfing conditions. One of the best surfing beaches in Europe. The surfing area is marked off by orange buoys. It works at all tide levels, but is at its best from low to mid tide, There are good sand bars along its length. As it faces a NNW direction, it is fairly sheltered from W and SW swells. During a SW wind it blows cross-offshore, useful when the North coast is blown out. Overlooking it is the Tate Gallery, something that I personally would urge you to visit. The smallest beach at St. Ives is Porthgwidden, very popular with small children. Just up the hill is 'The Island', here you will find St. Nicholas Chapel, in a location that once served as a lookout for smugglers. The beach is a real sun-trap, and has safe swimming within the buoys. Right in the centre of the town is the harbour beach, very sheltered and warm. At low tide the beach is very broad and ideal for sunbathing, right next to the colourful fishing boats. Make sure you avoid the seagulls though, they have become a real pest and must not be fed under any circumstances. Porthminster has half a mile of golden sands and good facilities. It is sheltered, normally calm, and is very safe for swimming. There is a walk along the cliffs to Carbis Bay as well. All the usual means of travel are available here, you need not be concerned about getting here or getting around. Just be wary of the parking difficulties in mid season. Another good reason to use the car less.